When Comic Books Ruled the Earth: Don't you just love Esteban Maroto's artwork? Don't you just love Esteban Maroto's artwork? I know I do! I've been really getting into Creepy and Eerie and so I've rediscovered my love for Esteban Maroto's artwork. When I was a kid back before you were born, I was very into those Lancer/Ace Conan paperback collections. I'd either buy one of those or a Choose Your Own Adventure book with my allowance each week. Most of the Conan covers featured teensy Frazetta paintings, but I remember some of them contained a few Maroto illustrations. I could be mistaken, but I'm pretty certain I first encountered Maroto's work in the context of Conan's world. Yeah, the mind plays tricks on you and all that kind of thing. Well, whatever. The point is, I liked what I saw and I copied his style in my school notebooks every day for a while. Badly, of course. Maroto never seemed to lift the pen or brush off the paper until he completed the image, leaving one sinuous, amazingly attractive line that formed-- usually-- some lush-lashed (yes, they had Maybelline before the dawn of time) princess or queen naked except for lavish jewelery Conan would probably steal from her after they made savage, prehistoric love or whatever it was barbarians did back in the Hyborean Age when they weren't killing giant snakes, trampling thrones beneath their sandaled feet or hanging out with Sandahl Bergman or Wilt Chamberlain. 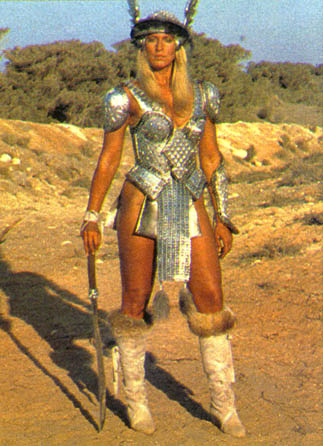 According to Maroto's website, he also designed Red Sonja's metal bikini armor. Not the most practical battle-wear, but it's served to make her a fairly popular character over the years. I can understand Maroto's motivation for drawing her that way, but I can't figure out why the character herself would go around dressed like that. She must be a mass of scar tissue. Then again, in Marvel's Conan the Barbarian comics our favorite barbarian did his sword thing wearing a fur loincloth and some boots, so he probably wasn't much better off. They were made for each other, these two legendary warriors, disfigured as they were because they dressed stupidly for battle. Put some clothes on, fictional people! The page above is what re-sparked my Maroto interest. It's a lovely pastoral scene from "Wings of Vengeance" (Creepy #81, July 1976), which he also co-wrote with Bill DuBay. I'm very into Art Nouveau, and Maroto's compositions here and his controlled use of negative space and "designy" plant life recall another fave of mine, Aubrey Beardsley. Specifically, the first four panels. The single female figure, the framing, the poses are all ultra-Beardsley-esque. Any of them could be blown up into a poster worthy of adorning an undergraduate's dorm room wall. This page shares with Beardsley's art the same sense of romantic decadence within a kind of fairy tale atmosphere. The draped and folded gown the woman wears seems very inspired by Alphonse Mucha as well. I love the subtle gray tone on their skin, which helps separate them from the from the white backgrounds. Enjoy this lovely young couple while you can. She's later tortured to death and he has his face cut off. If you happened to open a Warren magazine in the 1970s (something I rarely did because the covers were enough to scare me into insomnia), you stood a very good chance of finding Maroto's work. He was one of their most prolific artists during that period. Now imagine finding it beside some full-color Richard Corben nightmare, a Russ Heath axe-murder tale, an Al Williamson story with a space hero fighting alien dragons in a jungle, John Severin bringing horror to the Old West and maybe something drawn by Luis Bermejo. There might even be something set in the 1930s by Alex Toth! Don't forget Bernie Wrightson's frontispiece! All packaged by genius editor Louise Jones, who is now Louise Simonson and who also happened to edit and write some nifty comics for DC and Marvel-- including New Mutants. Which brings us full circle, I suppose. Anyway, Esteban Maroto! He did some great stuff in Vampirella too. There's a whole stable of B/W artists from that period I just love!! I haven't read any Vampirella yet. But did anyone's comics look as gorgeous as Warren's did during this time? That is, even when the stories were kind of nausea-inducing. "The Slipped Mickey Click-Flip," I'm looking at you! Baron and Rude return to Nexus! The Onion A/V Club interviews Jack Davis! Oh, Dani, don't you ever change!